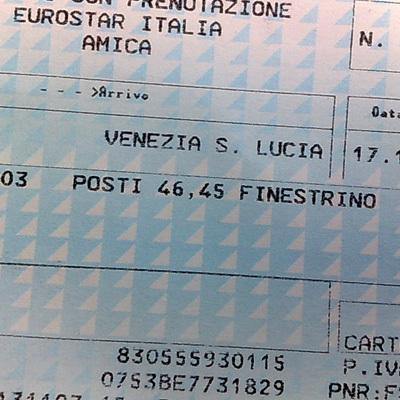 We're off to Venice on the Eurostar and this trip takes 2 hours 45 minutes. give or take any delays. 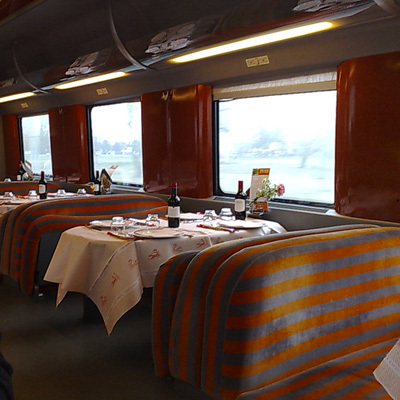 Since we won't be in Venice until 1.22pm we've decided to have lunch in the train Restaurant. I make a reservation on board and the service is to start after Bologna. This is the dining room and it is arranged in tables of four and two - we get a table for two. 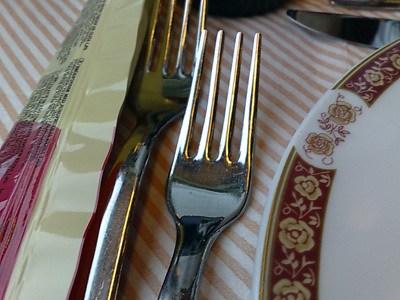 There's real cutlery and proper plates! 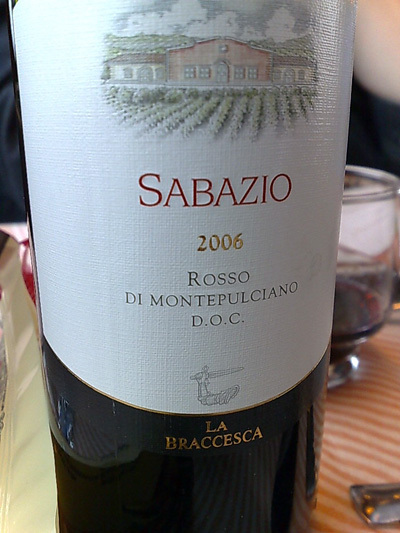 Our first bottle of wine is this half-bottle of Sabazio - it's very easy to drink and extremely pleasant. 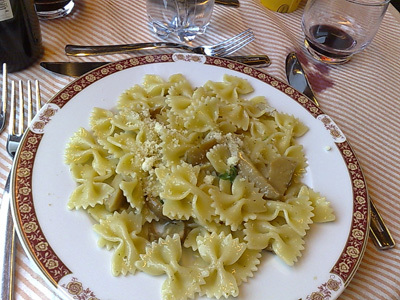 We both have the Farfalle with Porcini. It's interesting as you don't order the food, the waiter comes around with a large platter that has just come out of the kitchen and you tell him whether you want some or not. It is then silver served. 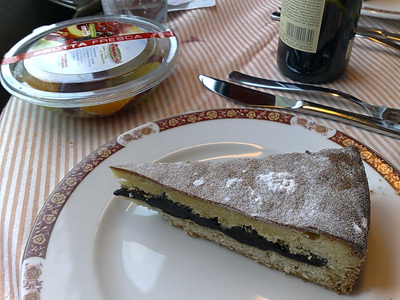 For the second course the menu listed a braise of beef but it wasn't ready in time - the food is made on the train. So we both have the other option. 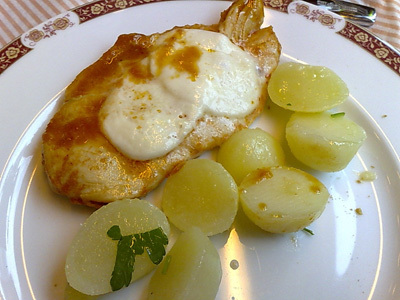 Chicken breast cooked in a spiced tomato sauce and topped with a slice of mozarrella - it is also silver served at the table along with the steamed potatoes. 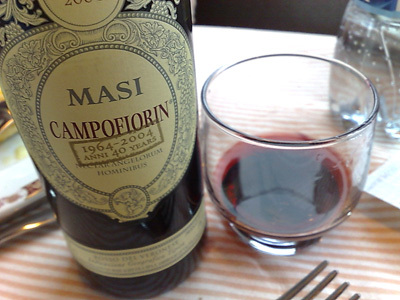 Our second red is this most impressive 2004 Masi Campofiorin - it's hard to believe a wine this good is served on a train. 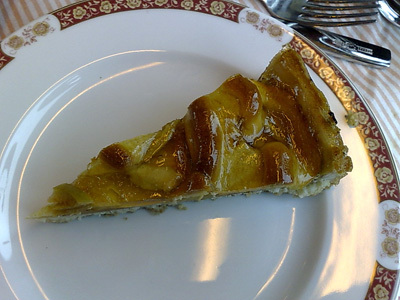 and Paalo has the chocolate tart. 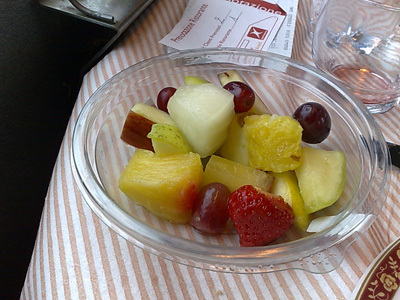 we also get this really good pre-made fruit salad which is wonderfully fresh - in comparison to some of the sorry excuses for fruit salad that we've had on planes, this is pure luxury. It's not the cheapest meal but for convenience and the quality I think it's a pretty good deal. We're certainly going to avail ourselves to the restaurant on the return trip from Venice.